I had this beer last night and with how I'm feeling this morning it is certainly living up to it's name! This is the second beer I'm having from Orkney Brewery (see Dark Island). The 8.5% really hit me quite hard, so this is another beer where the notes can hopefully get us through this review. Skull Splitter is such a good name for a beer with such a high alcohol percentage. The labels from this brewery are fantastic, I would happily send them to any collectors. The beer has tasting notes on the back, which I always appreciate, and they basically say this is an aromatic beer with lots of fruit and spices. The beer appears a redder colour than it appears in the photo. The colour is not that dissimilar to that of tea, except this has a thick finger and a half of creamy head on top. Some carbonation can be seen rising to this head, which has excellent retention. There is a thin layer of head that sticks around for the duration of drinking and this layer manages to lace the glass very nicely. This is another excellent looking beer from Orkney Brewery. On the nose this beer was really earthy. There are caramel and biscuity malts present as well as some raisins (or similar fruits). I remember is smelling slightly sweet overall while having a very subtle hint of smokeyness. Probably for the style there isn't enough roasting on the nose, but it may well come through in the tasting. The sweet nature of the aroma has me a little confused stylistically, but it's not an offensive smell and that can't hurt the score of this beer. WOW! 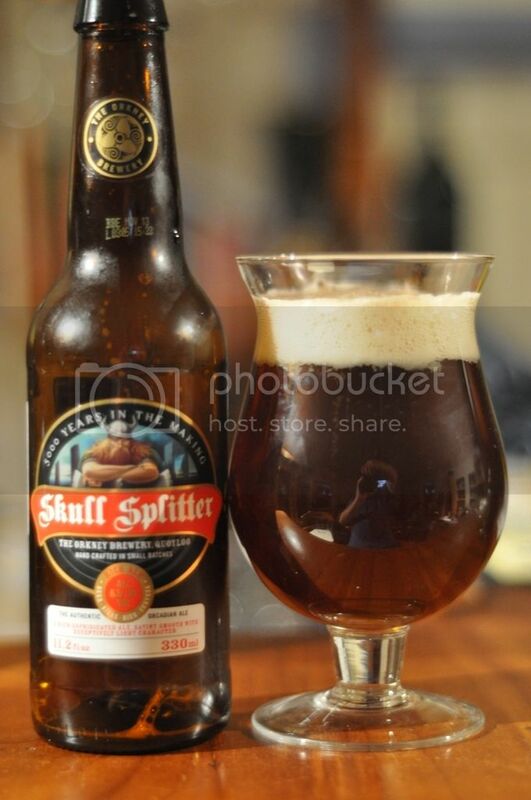 Skull Splitter has one of the most intense flavours of any Scotch ale I've ever had! This beer has it all, from the sweet tasting caramel malts up front to the spicy hop bitterness towards the backend of the beer. There are hints of warming alcohol but it's presence is not out of place in this beer. I can taste some dark fruits, maybe raisins or plums which really add to the complexity of this beer. The finish is slightly sweet and fruity, it's seriously delicious! One of the tastiest ales I have ever had! One of the first questions that popped into my head after tasting this beer was in relation to the name. Skull Splitter? Was the name a reference to the ABV (as I initially expected) or this absolute explosion of flavours that bombard the senses? Either way I love the name and I love the beer even more! If you like beer this is one that you simply must try!